NFL player Colin Kaepernick started a controversy when he chose not to stand during the National Anthem at a football game last year, saying "I am not going to stand up to show pride in a flag for a country that oppresses black people and people of color." Imagine if a star starting pitcher chose to take the mound in Game 7 of the World Series and not throw a pitch to draw attention to the issue of immigration reform. Professional athletes are idolized in this country, and their words and actions speak loudly. Should they then use the opportunity to speak out on issues that matter to them, or simply play the game they're paid to play? Such is the subject of Mixed Blood Theatre's immersive, site-specific, ambulatory play Safe at Home. 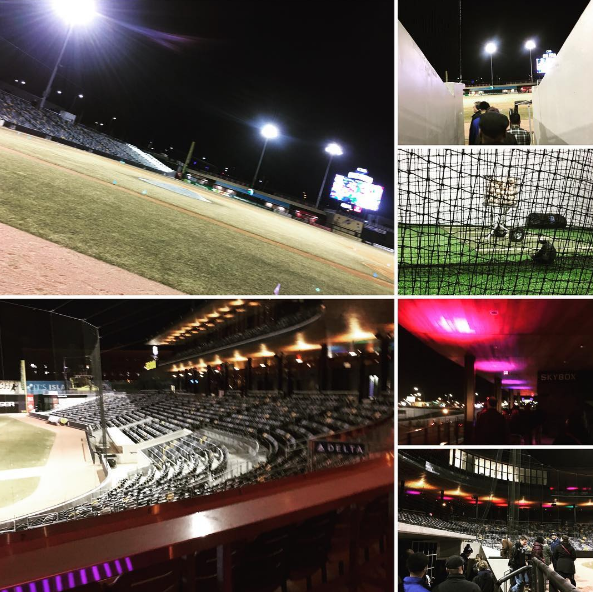 In nine short scenes, this story of a baseball player using his celebrity to make a statement is told in various locations in and around CHS Field, the beautiful new ballpark of the St. Paul Saints. It's an incredible one-of-a-kind theatrical experience, and I'd love to see this world premiere play created by Gabriel Greene and Alex Levy and directed by Jack Reuler performed at ballparks around the country. But in the meantime, head to St. Paul's Lowertown neighborhood to experience this engaging mix of baseball, politics, and theater. The show begins in a luxury club room at CHS field. Showtimes are every ten minutes from 7 to 9 pm, with groups of about 25 audience member led from location to location by a friendly guide. The story plays out in nine separate scenes with different characters, mostly two-person scenes. Loud music is played between scenes as the groups are on the move, while highlights play on the big screen and TV screens in every room, with a familiar baseball cheer signaling the beginning of the scene. The time counts down on the TV screen for all to see, and every scene I saw was remarkably on time (see also Mixed Blood's great football play Colossal, to which Safe at Home bears some resemblance). The complicated logistics ran flawlessly the night I saw the show (just the second night of performances), not an easy task but beautifully accomplished. It's Game 7 in San Diego, and the rumor is that the Padre's star pitcher Victor Castillo, from the Dominican Republic, is going to take the mound and refuse to pitch. You see, there's an election pending, and one of the candidates (who's in the ballpark) plans to change some of the policies put in place by the current president to make immigration more difficult. This is an issue that's near to Victor's heart, being an immigrant himself, and also because of the situation his brother finds himself in. We don't meet Victor (a riveting performance by Christopher Rivas) until the final powerful scene in which he tries to decide what to do, after we've heard about it from many different perspectives. I don't want to spell out every scene for you here, because part of the fun is the adventure of the journey. Let's just say that you'll meet everyone from the owner of the team (everyone's favorite former TV news anchor Don Shelby), to a presidential candidate (Regan Linton) and her political frenemies (Pat O'Brien and Harry Waters Jr.), to a couple of vendors hawking churros and beer (Fernando Collado and Mike Fotis), to some serious (or not so serious) fans (Ansa Akyea and Michael Lee), to the head umpire (Warren C. Bowles), to the team mascots in an odd dance-off between the Friar and the Chicken that probably has deeper layers of meaning than I can decipher (Brian Bose and Thalia Bea Kostman). You'll visit a luxury suite, the kitchen, a men's room, the batting cage, the clubhouse, the dugout, and more. Each scene adds a piece of the puzzle to what's happening with Victor, which as they add up say a lot about immigration policies, the culture of professional sports, and the great game of baseball. A couple of the characters believe that Victor shouldn't protest, because politics, and racial politics in particular, has no place in baseball. But at this point, it's pretty hard to separate politics from anything. Politics informs everything we experience, and expecting athletes (or artists) to leave their politics at the door when doing their job is a little unrealistic, because those politics affect them, their job, their community, and their loved ones. This play is ingenious not just in location but also in showing how politics affects all of us in different ways. The ambiguous ending doesn't provide easy answers, rather it encourages continued discussion. Mixed Blood's Radical Hospitality program is in effect for this show, but tickets are limited so you might want to reserve in advance if you're able. Note that you will be standing, walking outside, and going up and down stairs, but Mixed Blood wasn't named "Most Accessible Theater" by the Twin Cities Bloggers last year for nothing, so I'm certain they have a way to accommodate people who can't navigate stairs as easily as others. As a lifelong Twins fan, I know something about the thrill of victory ('87 and '91 world champs!) and the agony of defeat (every other year), and am lucky enough to remember two amazing Game 7s. But a love of baseball or other sports is not required to love this show. Either way it's one-of-a-kind experience that puts you right in the middle of the action in this beautiful ballpark with a fantastic 18-person cast making it all feel so real (and will likely make you feel anxious for spring and outdoor baseball!). Safe at Home continues at CHS Field through Sunday only - don't miss it!